Attention to detail has always been an essential part of what signifies a professional piece of work from that of an amateur. Whether it is a pinch of white noise wavering quietly over the mix or the slightest tweak of a compressor, the most miniscule change can make all the difference in the end result. 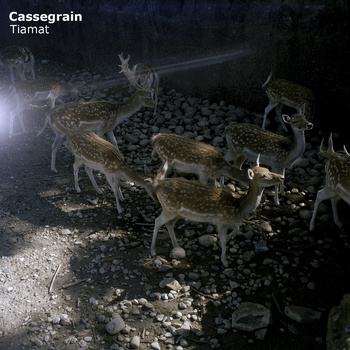 This is something that Alex Tsiridis and Hüseyin Evirgen, the duo otherwise known as Cassegrain, understand very well. Having released a slew of EPs on such renowned, boundary-pushing labels as M_REC Ltd., Killekill, and Prologue, their latest release is a true testament to the art of techno. Tiamat is comprised of six tracks, and while the album as a whole is a journey in and of itself, each track certainly tells its own individual story. We begin with “Taiga” – a slow, spacey, dubbed-out groove that shuffles into being, gathering a harrowing assortment of gurgles and hisses as it takes you deeper and deeper into itself. Eventually sharp rhythmic spikes break through the murky soundscape, swinging along with the beat and adding a healthy dose of tonal tension. From here the tempo picks up a bit with “Joule”, a minimalist excursion filled with polyrhythmic squelches of noise, deep bass, and piercing high-hats. The track builds slowly and patiently, dragging the listener down into a dark, hypnotic state without the use of common “build” and “drop” devices most producers would succumb to. The next track, “Turn Aside”, begins with nothing more than a kick, fluttering 16th note hats, and the faintest whispers drifting ever so far away. As it forms these whispers grow into words, and from words into screams as crunchy stabs of static and synths come into play, pushing the track forward into an enticing yet terrifying dance of texture and rhythm. After this comes “Tiamat” – the title track of the album. It is easy to see why it was chosen to be the title track when one considers its chugging percussion, warm blankets of tones, and bubbling sound design. The track creates an environment that feels ready to burst at any given moment – and indeed it does - but not how one would expect. In fact this is one of the best examples of how Cassegrain play with the predictions of the listener in that they will take out the bass for elongated periods of time, toying and toying, waiting for the right moment to move forward. Until finally, after the listener is thoroughly confused, the track bursts open and spits them right back into the unique groove it so seamlessly established beforehand. These musings are expanded on in the next track, “Task”, which beeps and groans like an old factory machine that is being worked into its grave. The title is very appropriate in that it feels like you are listening to the inner workings of your mind while doing a complex logical task, neurons firing off every which direction while pulses of blood run through your veins, supplying you with the drive to keep on moving. For the last installment of this journey we are presented with “Ignite”, which is probably the best demonstration of the aforementioned attention to detail. It takes its time, slowly congregating a range of otherworldly sounds that evolve and expand into an immersive sonic landscape. There is almost a hint of jazz influence in some of the rhythmic patterns, as though Max Roach’s ghost is tapping away on the table behind you. One of the things that strikes me most about Tiamat is how spectacularly unique each and every sound is. They appear as worldly and concrete yet simultaneously ethereal, and all work together cohesively in each track. While some producers may be content using banks of sounds there is no doubt that Cassegrain craft each one from the ground up, and the result is very telling. On top of this, the way in which they toy with the conventional structures of techno is both enticing and effective, and shows true mastery of the sound. Tiamat comes as an excellent addition to an already impressive catalogue on Prologue, and should not go unnoticed by anyone who claims to be a fan of electronic music.